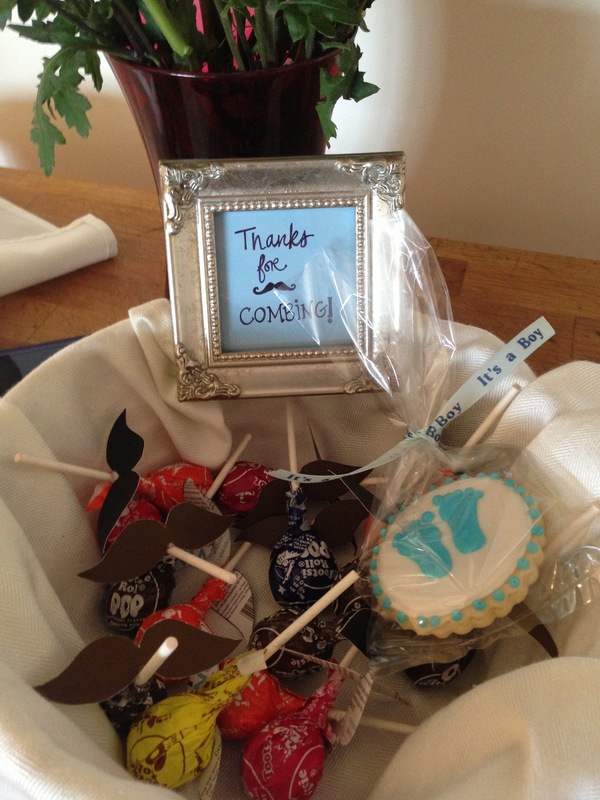 My sister’s best friend of 20 years is having a sweet baby boy. Like soon… she’s 4 weeks out. 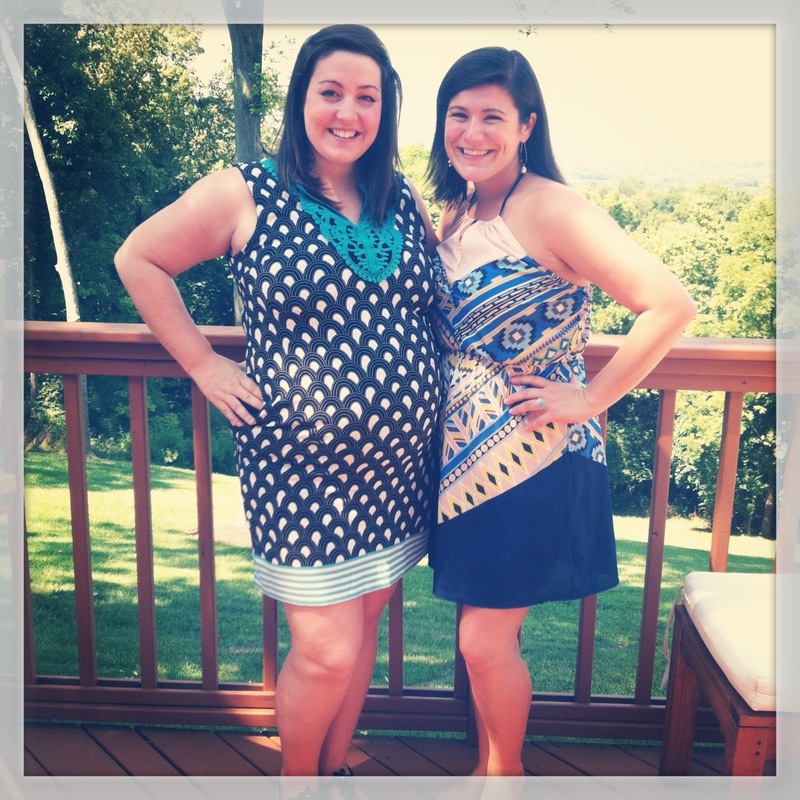 In honor of Kait and her sweet little man, we threw her one heck of a baby shower. Kait is trendy and cute in every way so we knew she would be all about a theme… and mustache theme was exactly what we were looking for. 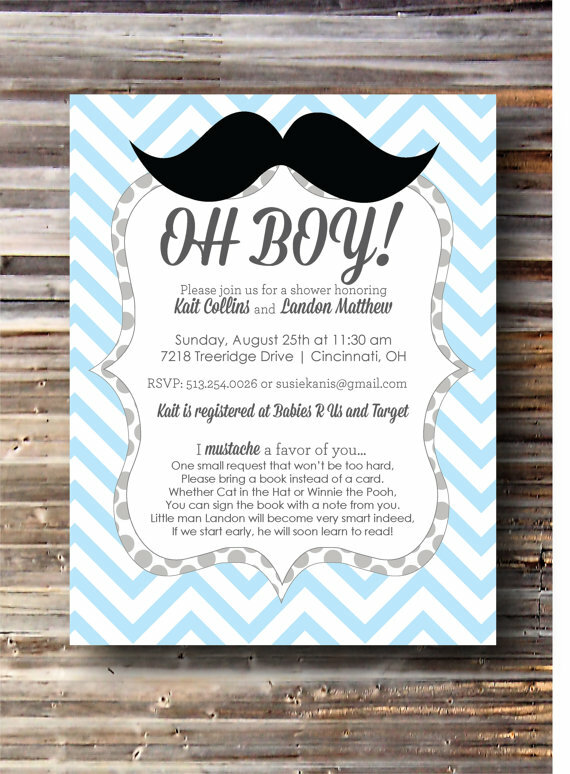 My sister and I started a mustache themed baby shower pinboard and got to work. Our sweet invitation done so nicely by Katie at Custom Creations by Kate. If you read the bottom section, we used a Pinterested rhyme to ask guests to bring books instead of cards. And they did! Katie also made a really cute matching game print out. Unfortunately I have no clue where an image of that is. Noteable: Katie is also The Almost Vegan. And you don’t have to be vegan to devour her amazing recipes. 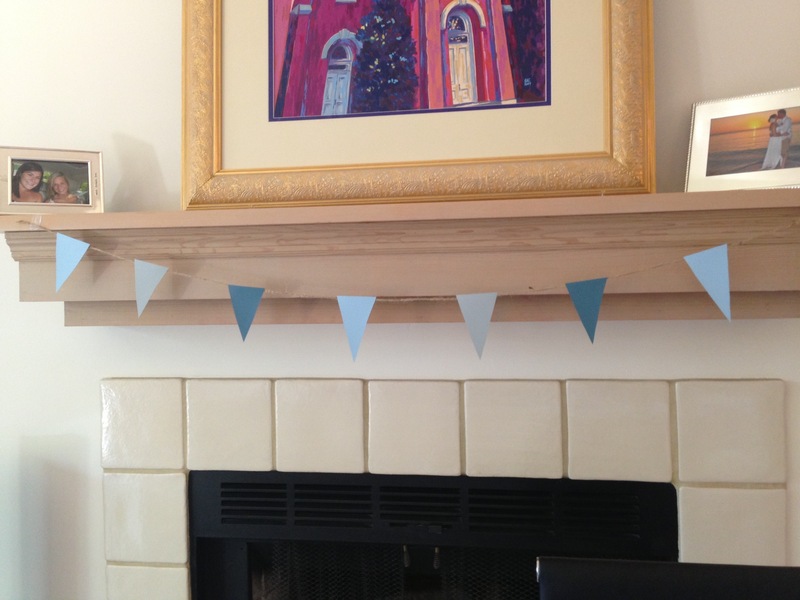 I made my signature paint chip pennant banner in navy, gray and blue. They were hung over doorways and windows and of course, the mantle. Tutorial here. I made cupcakes and iced them by piping whipped icing onto the tops like I’ve done before. Then I pressed on paper mustaches that I had cut from Martha Stewart (they are the largest I can find at Home Depot) paint chips. 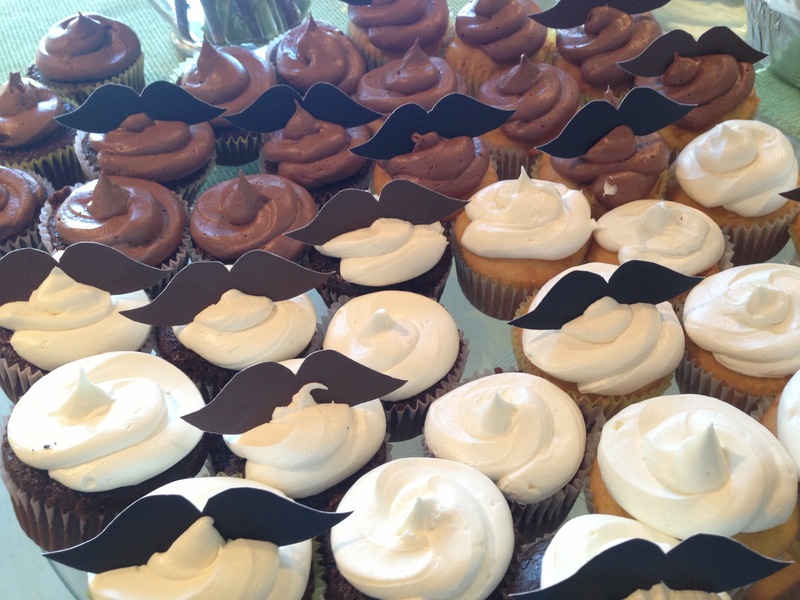 I used the same paint chip mustaches to decorate party favors. I hot glued them to the sticks of tootsie pops so that when you put the sucker in your mouth it gave you a “mustache”. 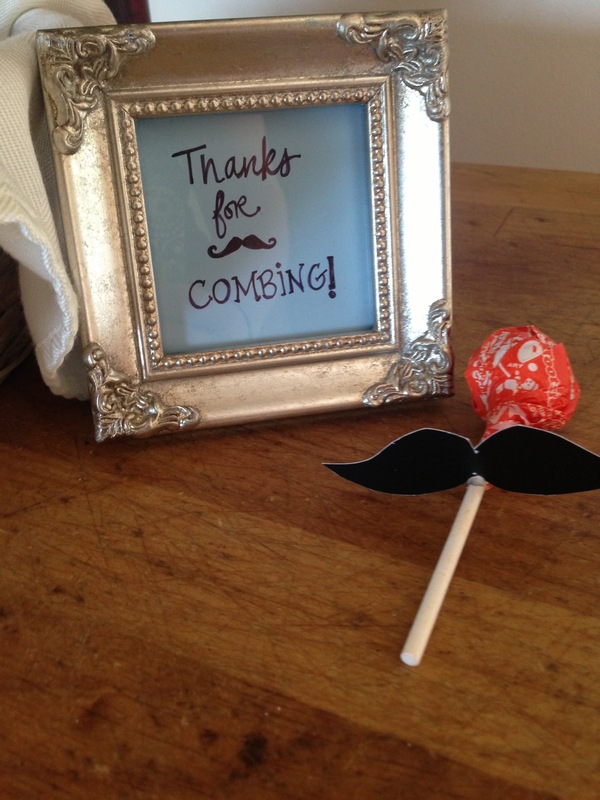 We placed those in a basket with a framed paint chip that said “Thanks for COMBING!” … haha. Get it? 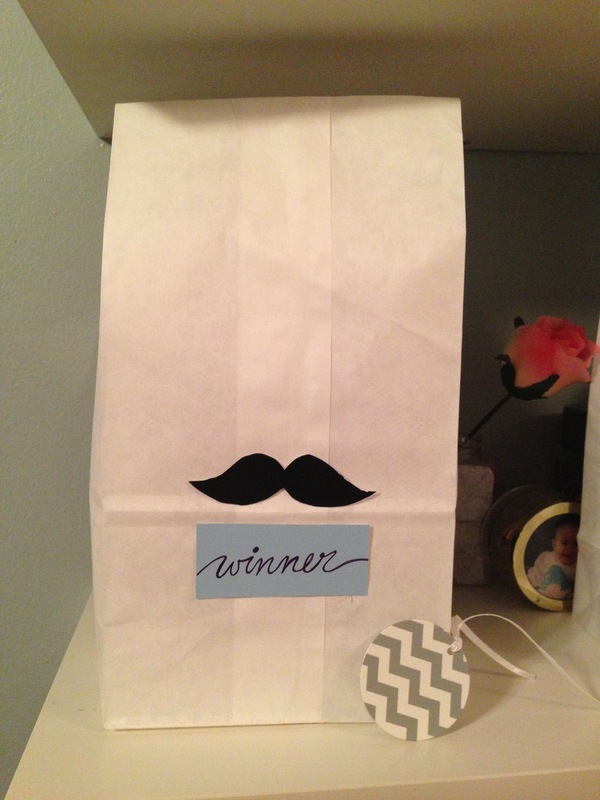 This was one of the gift bags for game winners. Sneak peak into those here. I found stick-on fuzzy mustaches at Ted’s Toy Store, a local toy store. If you’re in the Cincinnati area be sure to check out Ted’s in Madeira. Its my go to for every gift- he carries unique games, trendy toys and classics from your own childhood. Anyway I bought them on the spot, although I wasn’t sure how I’d use them. 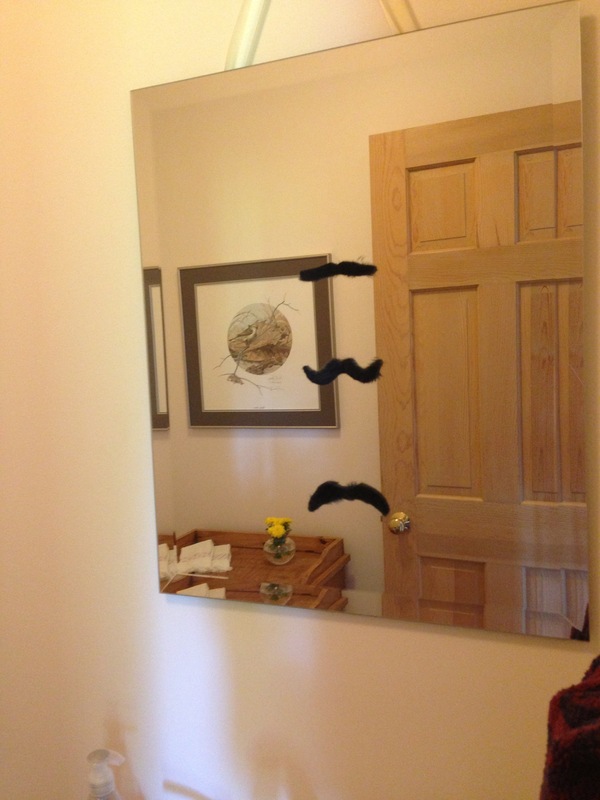 The day of the party I decided they’d be funny on the bathroom mirror so that guests could see a mustache on themselves. I stuck 3 of them on the mirror vertically. I figured that peoples’ heights vary and things look better in threes. Everyone commented on them. 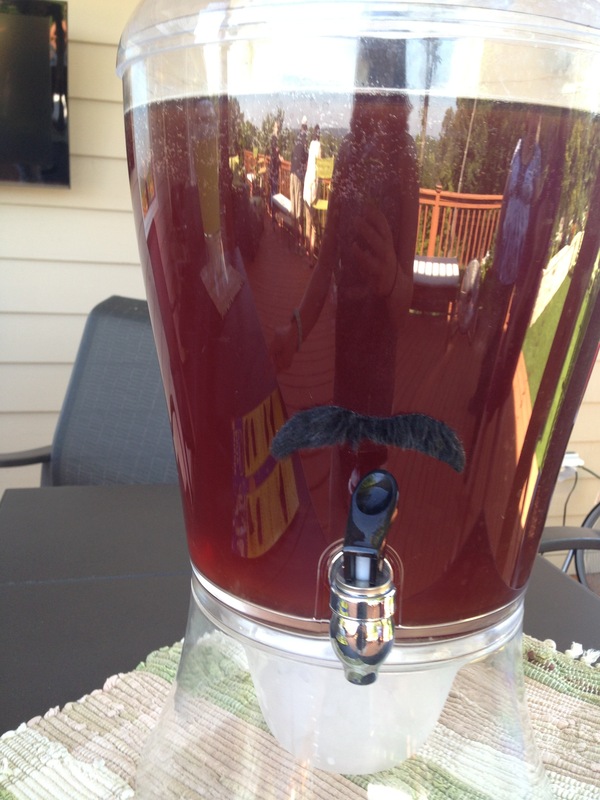 I also stuck them over the spouts of our refreshment dispensers. Also I huge hit with guests! 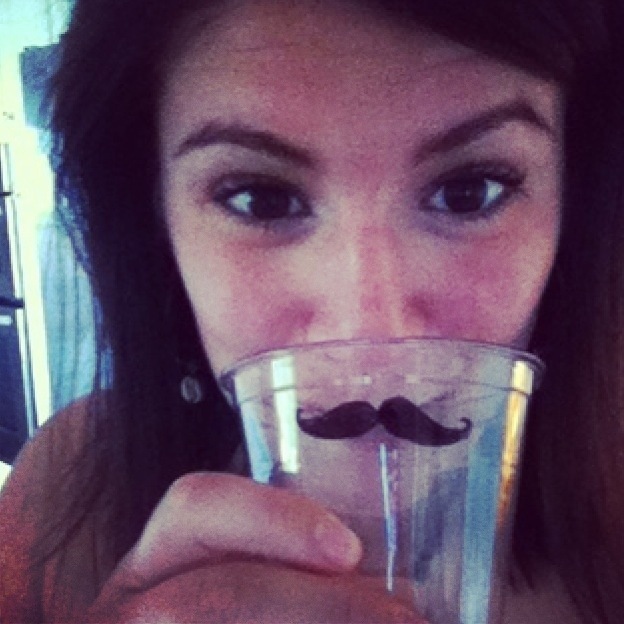 Guests also drank from plastic glasses we had Sharpied mustaches onto. 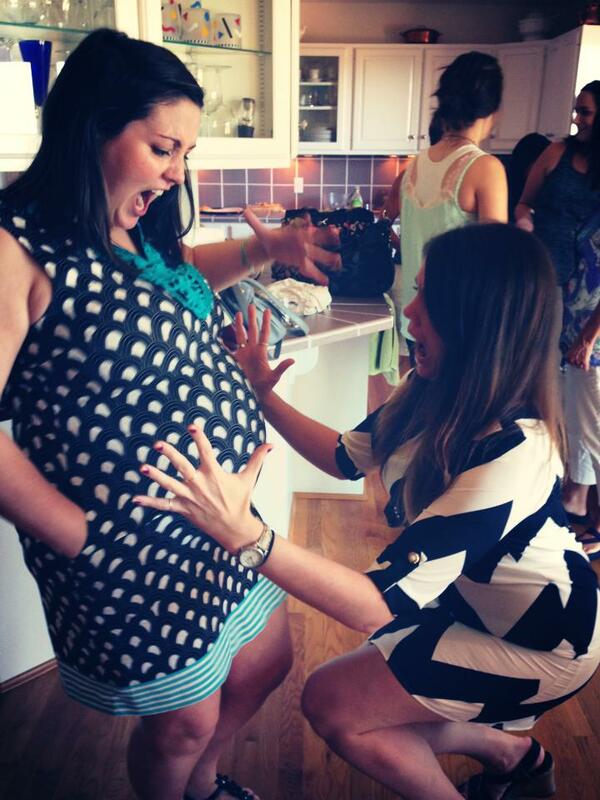 Ps- serving mimosas at a baby shower is the best idea we’ve ever had. I highly recommend it! 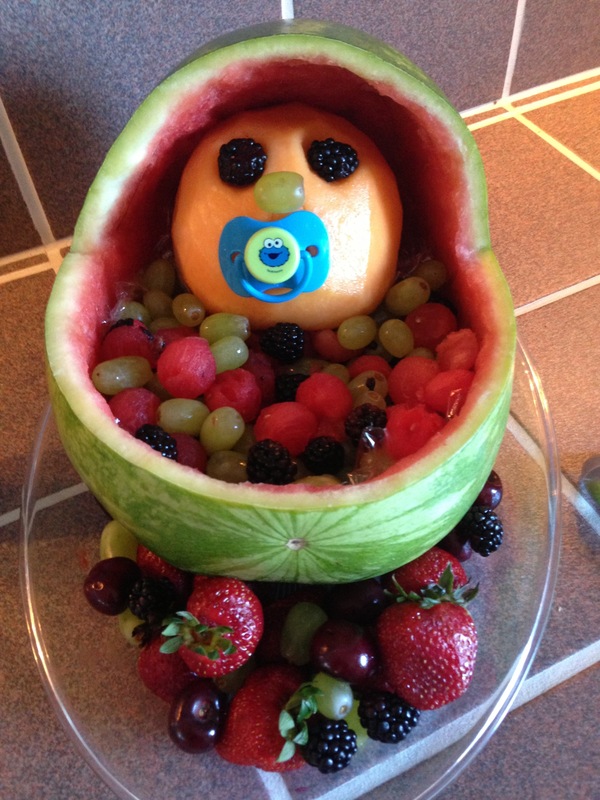 Kait’s sister made this adorable fruit salad… er, um sculpture? How cute! She too gave credit to Pinterest. 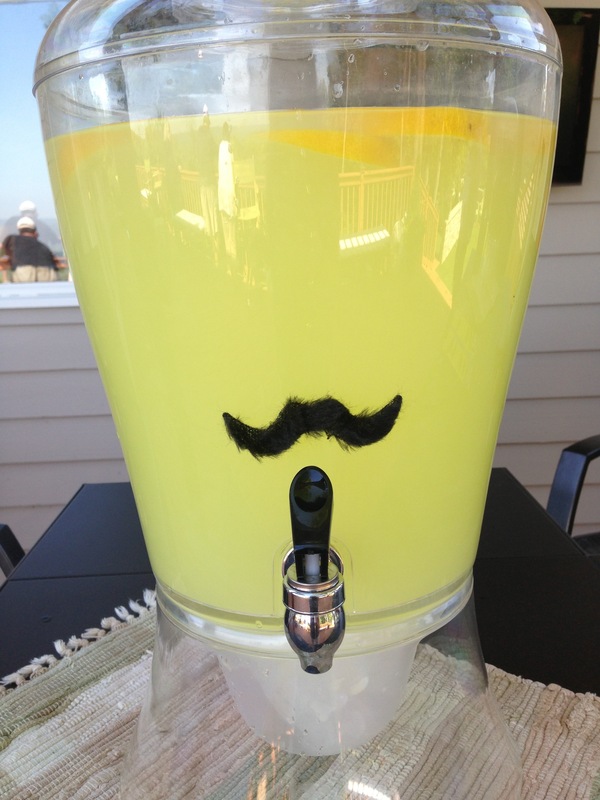 I think we all drink the Pinterest kool-aid these days. Best photo of the day: Kait and our friend Joanna posing for an OH MY GAWD shot. I think they had fun! Oh my goodness – thank you for including me in your post 🙂 I just noticed this when you came up on my Etsy traffic sources! You are too sweet… I can send you a pic of the game too if you want it, just email me!